Remember my friend I told you about last week that just had her second baby? Well as a mom with two kids under the age of two, one who runs around all day and another who needs to be fed every few hours, she's not getting out much. So we've decided to start a weekly tradition of Thursday Nights In. Instead of going out to dinner or meeting up for drinks, and making our already busy schedules even busier, we bring the party to her. Since I'm the one in the group who loves to cook, I usually whip up something simple for dinner (last week it was the One-Pot Root Vegetable & Lentil Quinoa Stew) and she supplies the wine (and cute kiddos). But this week we did things a little differently. She thought it would be fun to order from a few local restaurants and have some different cuisines to try. 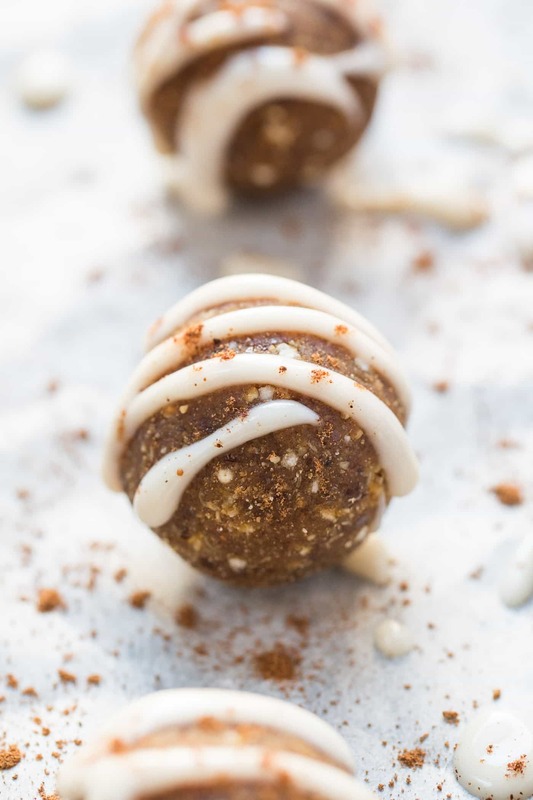 Of course, you know me and there was no way I was showing up empty handed, so I brought these healthy Pumpkin Spice Truffles for us to snack on as we chatted, sipped wine and enjoyed a little peace and quiet. These truffles are the perfect party or holiday sweet treat. 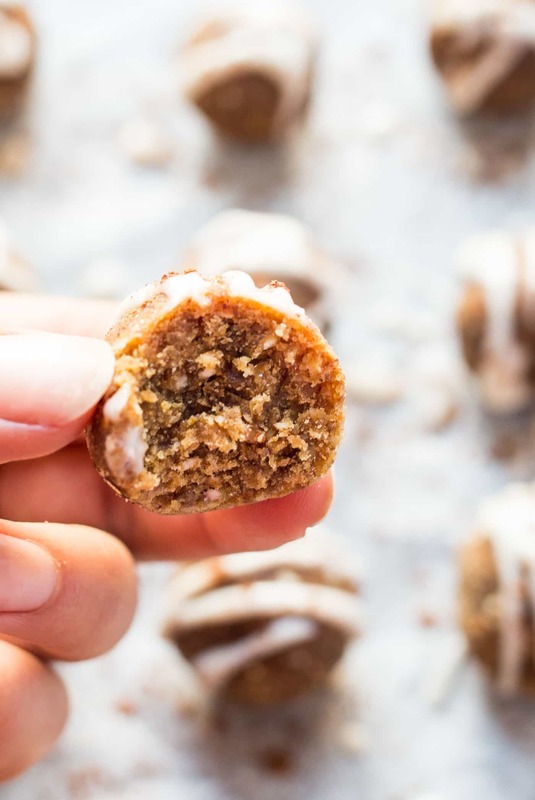 They're super quick to make, don't require any baking, are healthy, but still taste totally decadent. 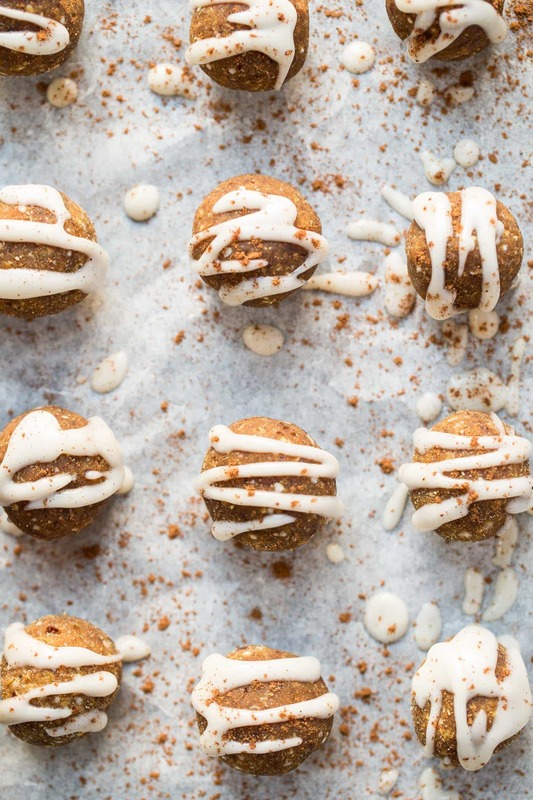 It's one of those desserts that plays tricks on your mind–tastes like you're eating a slice of pumpkin pie, but in reality, it's more like a little energy ball! 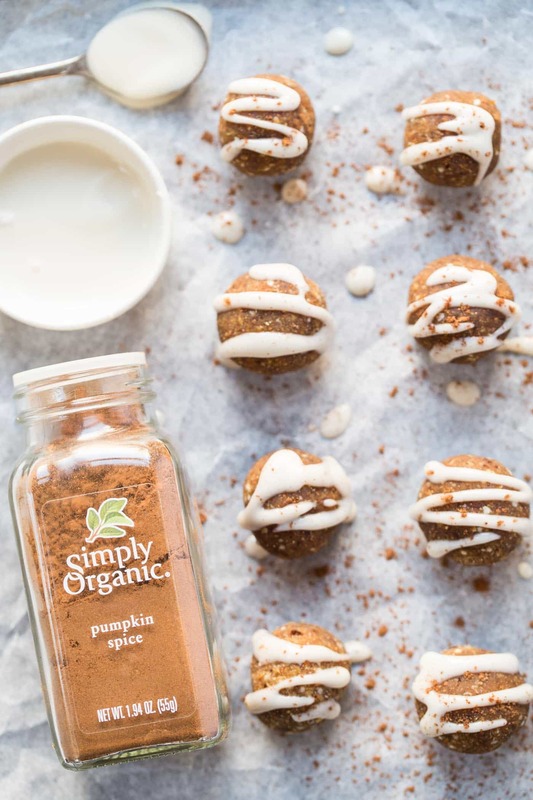 I'm super excited to be partnering with Simply Organic this year to bring you lots of new recipes using their incredible spices. Every Thursday throughout the holiday season, we want to inspire you to schedule your own #ThursdayMoment – an escape around all the things you love, including friends, family and great food. 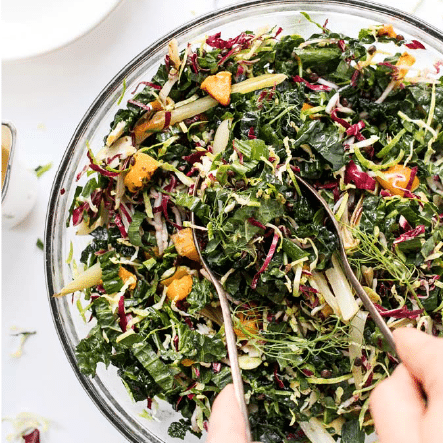 All season long I'll be sharing recipes focused on helping you take a little bit of the chaos out of this time of year–simple recipes that don't take long to make and can be shared with friends and family. First thing we will need is some pumpkin pie spice! 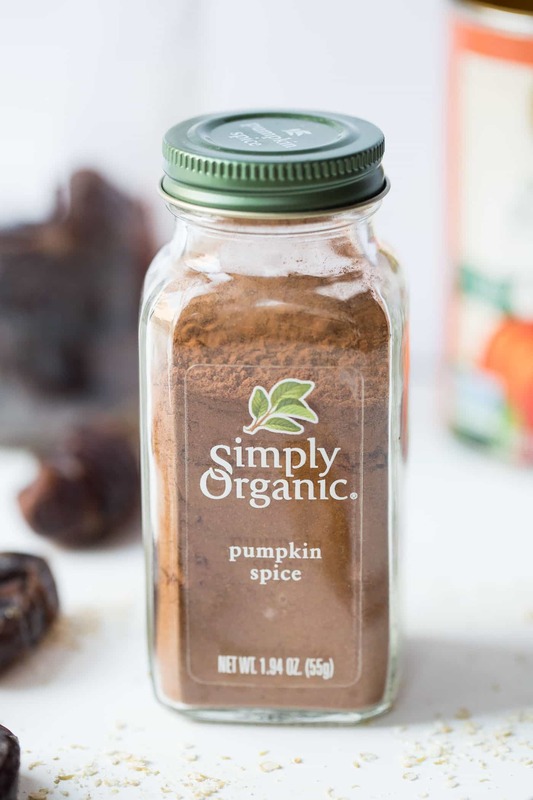 I'm using the Simply Organic Pumpkin Spice blend which is the perfect balance of cinnamon, ginger, nutmeg and cloves. And you don't have to worry about having all those spices on hand. I've literally been using this for everything–from my morning matcha lattes, my green smoothies and pretty much all my desserts. 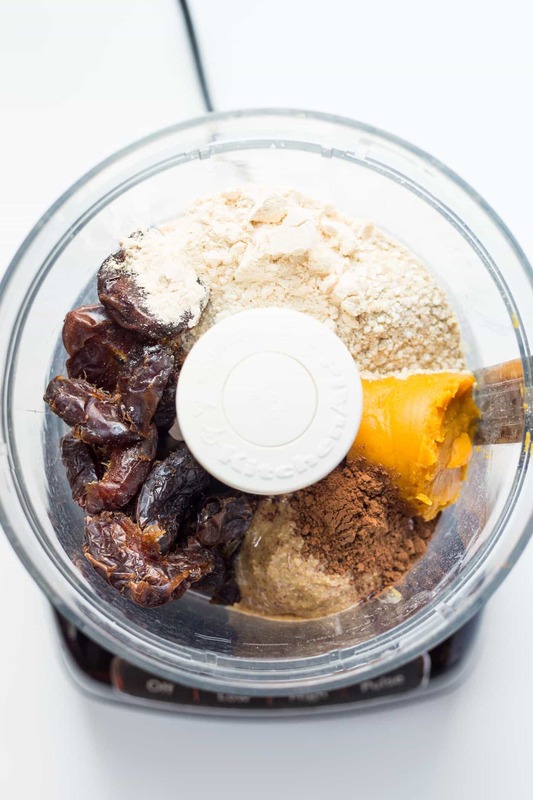 The base of our truffles is simple: dates, pumpkin puree, almond (or peanut) butter, coconut oil, coconut flour, quinoa flakes and pumpkin spice. 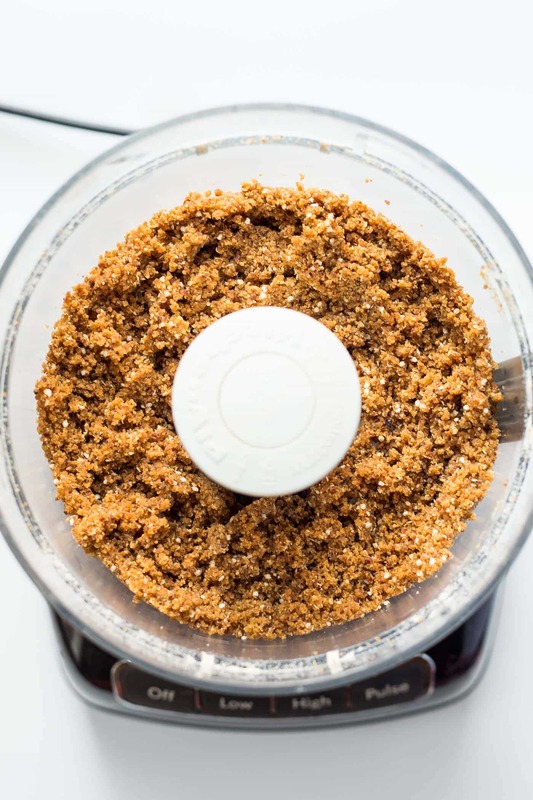 Blend it up in your food processor until it forms a crumbly texture then roll them into balls and done. It takes about 10 minutes start to finish which is a heck of a lot faster than baking a pumpkin pie! Or even a batch of cookies for that matter. To make mine a little more festive, I decided to whip up a quick coconut butter glaze. It was a total shot in the dark, but it actually ended up working really well. All I did was melt some coconut butter with a little maple syrup, coconut oil and almond milk and then drizzled it on top. It was slightly sweet, dried like an icing and added a wonderful creaminess to the truffles. 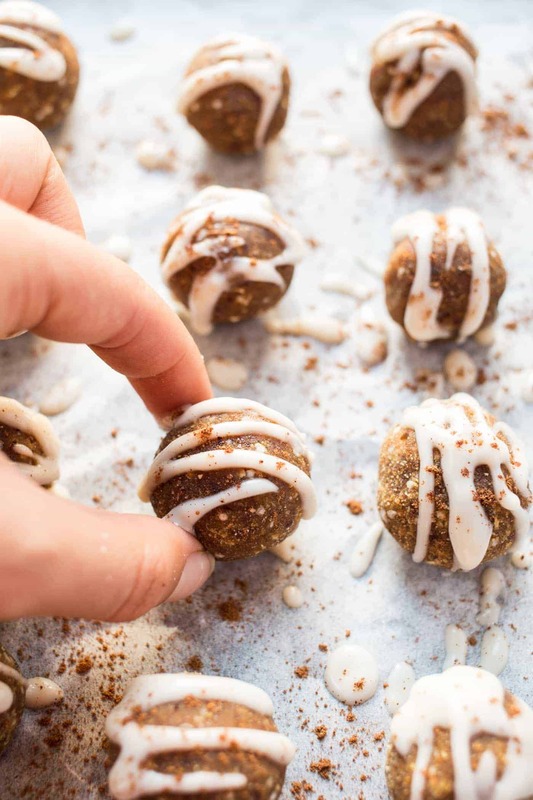 So whether you're having a night in with all your gal pals and you want something healthy and sweet to finish the night off with, or maybe you're headed to a holiday potluck, or even have an office cookie exchange, these healthy pumpkin spice truffles are sure to be a hit. What is your favorite way to destress during the holidays? 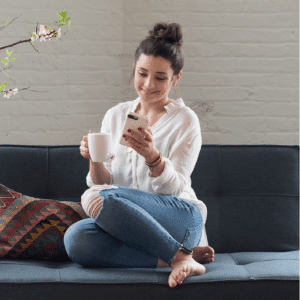 If it's girls night in, cozying up with a good book with your furry friends, or just a simple date night out with your significant other, take the time to create those organic moments. It will make everything so much more special! P.S. 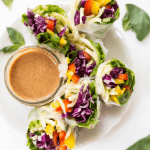 Share your Organic Moments and enter to win the Simply Organic Ultimate #ThursdayMoments Giveaway by taking photos of your party and recipe creations and uploading to Instagram using #ThursdayMoments. These truffles are the perfect party or holiday sweet treat. 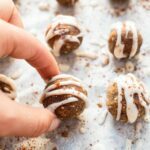 They're super quick to make, don't require any baking, are healthy, but still taste totally decadent. 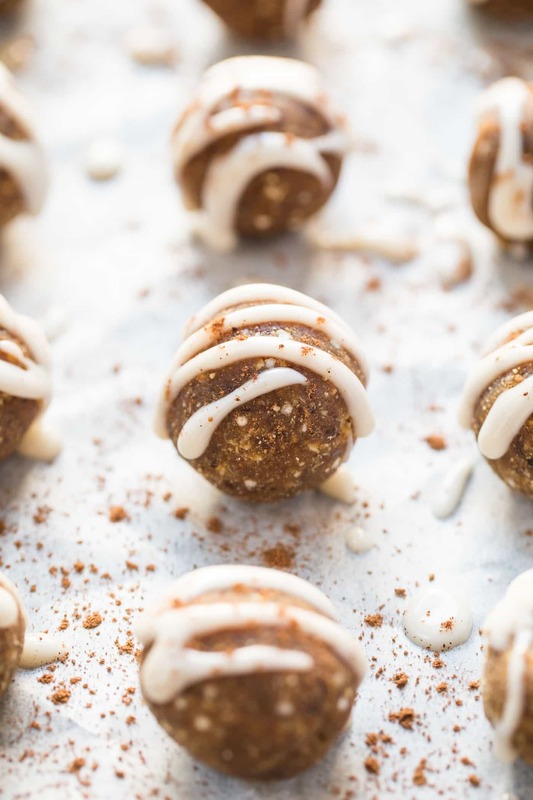 It's one of those desserts that plays tricks on your mind--tastes like you're eating a slice of pumpkin pie, but in reality, it's more like a little energy ball! Add all the truffles ingredients to the bowl of a food processor. Process on high until crumbly and sticky. Roll about 1 tablespoon of dough between your hands to form little balls. 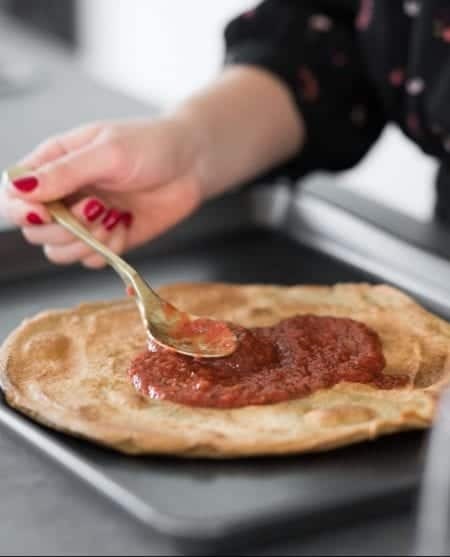 Set them on a plate and repeat until no dough remains. Pop the truffles in the fridge while you make the icing. Melt the coconut butter in a small saucepan over low heat. Whisk in coconut oil and maple syrup. Slowly pour in the almond milk, continuing to whisk until smooth. Drizzle the icing over the balls (or dunk the balls into the icing). Sprinkle with some pumpkin spice if desired. Place back on a plate in the fridge to let the icing set, about 10 - 20 minutes. 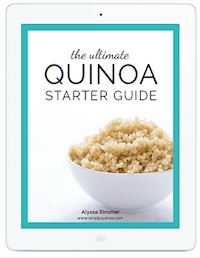 Thanks to Simply Organic for partnering with me on this recipe. And thank you for being here and supporting the companies I believe in and help make SQ a reality! Hi Alyssa! I am so excited to try this. Do you have an opinion on how long they keep? At least a week in the fridge, but months in the freezer! Can you make some substitution suggestions for someone who is allergic to coconut? It’s a pretty big portion of the recipe, so I’m not sure what the best substitute would be. You could try almond flour, but I think you’d want to add at least 1/2 cup! My boyfriend and I loves these Turkish Figs (dried) & was wondering what are the difference between the dates & figs when using them in a recipe. Can you use figs instead of dates? Are they softer or harder to work with? Do I soak the figs to soften them up?